2014 marked an incredible year in Atlético Madrid's history. For just the second time in the club's history, the 'other' Madrid outfit managed to reach the Champions League Final. They also won the Spanish league title for the tenth time and recently defeated Spain's Cup holders Real Madrid in the 2014 Supercopa de España, just the second time they have won that trophy. Today's day however, marks another incredible time for Atlético. 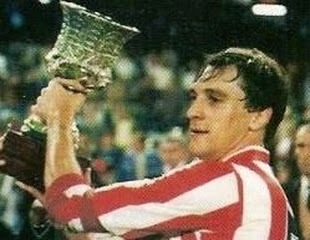 On October 30th 1985 Atlético Madrid would go on to win what would be their first Supercopa de España after defeating the previous season's league champions Barcelona over two legs. 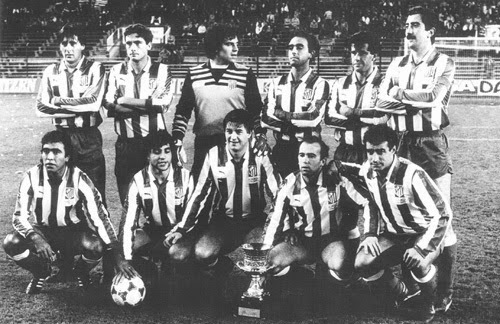 Led by Spanish coaching legend Luis Aragones, who coincidentally passed away this year to mark another chapter for Atlético in 2014, the club from Madrid punished the defending champions in the capital at the Vicente Calderón Stadium on October 9th, 1985 by a final score of 3-1. After conceding the first goal, Atlético hit the back of the net three times thanks to goals from three different players, of three different nationalities. The first to tie the match up came via Argentine striker Mario Cabrera, the second from Spanish center-back Miguel Ángel Ruiz and the last from Uruguayan international forward Jorge da Silva. With the momentum in their favor, the first leg winners headed into Camp Nou on October 30th knowing that the chances were on their side, but the venue in Barcelona was no walk in the park. Barcelona was led by Englishman Terry Venables who led the Catalan side to an impressive 10 point margin league championship the year before (in an era when a win was just worth two points). In the 32nd minute just like in the first leg in Madrid, Barcelona took a 1-0 lead. Center-back José Ramón Alexanko put the ball into the back of Atlético goalkeeper Ángel Jesús Mejías's net with an impressive low shot from just inside the penalty area. The goal from Barcelona, together with the away goal at the Vicente Calderón Stadium meant that one more goal from the hosts could see the home side win the trophy. But Madrid's defense was resilient and withstood Barcelona's attacks. The back four which included team captain Miguel Ángel Ruiz dug in to hold on to the 1-0 defeat to claim their first ever Supercopa de España, a title they would have to wait nearly 30 years to win again.